Hollywood could not have scripted anything better than what played out last night at Valvoline Raceway when Sam Walsh and Robbie Farr entered the night tied on points in the battle for the Ultimate Sprintcar Championship, while Victorian Jamie Veal took the chequered flag in the 30-lap final. A late race red flag, with just two laps remaining, set the situation up perfectly with Veal in the lead followed by Sam Walsh in second and Farr in third. The winner of the USC would be decided by whoever finished in the best position and it was Walsh who fought off all of Farr’s challenges to remain second and take the championship win. The race began with Farr on the front row, along with Marcus Dumesny, and it was Farr who took the early advantage, leading the opening 13 laps before Veal, who started from position 5, swept past Farr. That was a crucial move in the championship landscape as Farr missed out on the 4 bonus points for leading the most laps. The first stoppage came early in the race when Marcus Dumesny rolled lightly onto his side and although restarting, the championship fight for Marcus Dumesny was over. A few laps later Matt Dumesny brought on the yellow lights after a spin. On the ensuing restart, Daniel Sayre and Grant Anderson were involved in a melee, ending their race. The race then resumed and got into a rhythm with Veal leading followed by Farr and Walsh. Eight laps from home Walsh moved into second and the battle raged and looked like the race was going to finish like this before Luke Stirton brought the red light on after flipping. This set up a two lap sprint home. At the restart Veal powered away and led the remaining laps to record his 17th career win in Sydney. Walsh held on to record his first Ultimate Sprintcar Championship and Robbie Farr placed third. Australian champion Andrew Scheuerle returned to Sydney with a great result, coming home in fourth while Michael Saller had a very impressive night, coming home in fifth. Matt Dumesny recovered to finish sixth, followed by Jackson Delamont, Danny Reidy, Ben Atkinson and James Thompson rounded out the top-10. Eleventh home was Grant Tunks followed by impressive Queenslander Randy Morgan, Jessie Attard, Daniel Cassidy, Marcus Dumesny and Mick Matchett having one of the best runs this season finished 16th. Non-finishers were David Murcott, Stirton, Sayre, Anderson, James Duckworth, Jordyn Brazier, Bruce White and Alex Orr. Earlier in the night, four qualifying sessions were run with Attard, Saller Veal and Farr setting quick time in their heat race groups. In the heat races, wins went to Shane Sheedy (non-qualifiers heat), Matt Dumesny, Walsh, Marcus Dumesny and Farr. The C Main went to Kiwi Dean Brindle, Guy Stanshall, Luke Geering and Brayden Cooley. The B Main saw the win go to Stirton from Orr, Thompson and Duckworth. 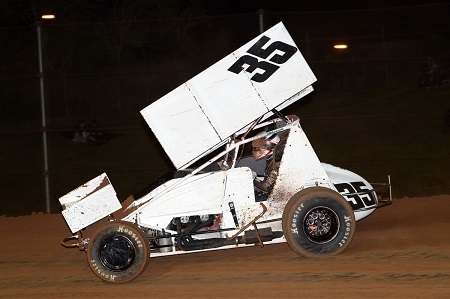 There is one final event to round out the Sprintcar Association of NSW season and that will take place this Easter Saturday night at Goulburn Speedway.